WELL, YOU might see something different in this photo. 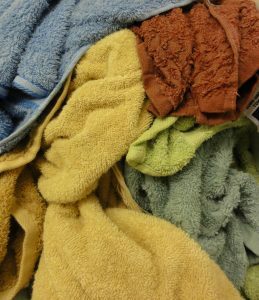 But I saw Ali Baba in a pile of towels on my laundry floor. Yellow profile with big ear, and red turban/head gear. Other people have seen other things in this pic. This is another example of “Pareidolia” – seeing recognisable objects in random patterns. Like seeing familiar shapes in cloud formations. My vision impairment actually enhances this phenomenon. So quite often, I see “stuff” where it doesn’t exist. I need to get a life I think.